Man From U.N.C.L.E. marks the first time Guy Ritchie has directed since 2011’s Sherlock Holmes: A Game of Shadows and he has not skipped a beat. The film industry is full of cycles. Every couple of years, a new genre takes over the industry's slate of film releases. One can easily argue that, lately, it has been the superhero/comic book genre. However, another one has slowly crept into the mix in 2015; the spy film. This year has already seen Kingsman: The Secret Service, Mission: Impossible Rogue Nation, The new James Bond, Spectre, later on this year and coming out this week, Warner Bros. Man From U.N.C.L.E. Man From U.N.C.L.E., based on the 1960s TV show of the same name, is essentially a prequel to the events that led to the creation of the U.N.C.L.E. (United Network Command for Law and Enforcement), a secret international counter espionage and law-enforcement agency. 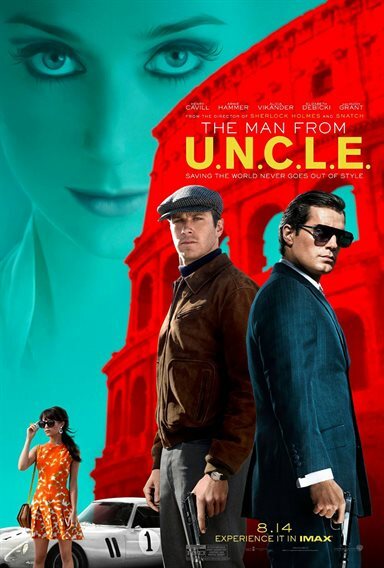 The film focuses on American super spy, Napoleon Solo (Henry Cavill; Man of Steel) and Russian super spy Illya Kuryakin (Armie Hammer; The Social Network) as they team together with the lovey West German Gaby Teller (Alicia Vikander; Ex Machina) to stop an international criminal organization, bent on world destruction, during the height of the cold war era. The film can easily be summarized as a throw back to the early James Bond films (ironically Ian Fleming contributed to the shows initial concept). Back are all the low tech spy gadgets and playfully setup action scenes that audiences will enjoy, not for the non-stop thrills, but the cleverness on which they are executed. With sets looking as if they had just come from Goldfinger, or Alfred Hitchcock's North by Northwest, Man From U.N.C.L.E. does not shy away from going all out to make it's target 60s era look authentic. The producers tried to find as many authentic items as possible to use on set. The cars, the clothes, even the ruins in Rome, appear as if you are looking at a diorama from that time period. Man From U.N.C.L.E. marks the first time Guy Ritchie (Lock, Stock and Two Smoking Barrels, Sherlock Holmes) has directed since 2011's Sherlock Holmes: A Game of Shadows and he has not skipped a beat. Under non-skilled hands, Man From U.N.C.L.E. would fizzle with today's fickle audiences. However, Ritchie makes this film his own, and adds style and substance like only he can. He is truly a director that comes along once in a lifetime. Other than occasionally thinking that Henry Cavill can escape some of his perils by flying up in the air as Superman, the film's cast does an amazing job filling their respective roles. Henry Cavill is spot on playing a cocky american spy that, no matter what, can get out of any situation. Armie Hammer plays the Russian muscle spy that is sexually frustrated to a tee and between Ex-Machina and this film, Alicia Vikander is truly showing her acting skills. It will be interesting how she handles herself in the upcoming Bourne film. The rest of the supporting cast, including Hugh Grant (Four Weddings and a Funeral), Elizabeth Debicki (The Great Gatsby), and Jared Harris (Sherlock Holmes: A Game of Shadows), nicely rounds out the cast of characters that makes the film so enjoyable to watch. Download Man From U.N.C.L.E. from the iTunes Store in Digial HD. For more information about Man From U.N.C.L.E. visit the FlickDirect Movie Database. Read More Reviews For Man From U.N.C.L.E.